Prior to 2012, the Park & Ride service was operated using vans and trailers. 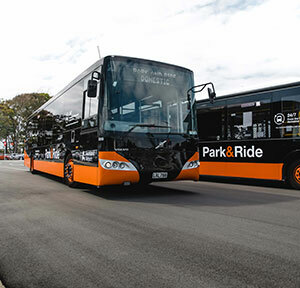 When Bustravel NZ were awarded the Park & Ride passenger contract, the company introduced a fleet of urban buses and expanded the hours of operation to 24 hours. This allowed a superior service and comfortable customer experience. The service has experienced exponential growth in the six years Bustravel NZ have operated the service. In 2012 it carried 200,000 passengers, and today the service carries close to 3 million passengers a year! From a single customer reception lounge, to now three within the 4,300 space car park, with one lounge dedicated to Auckland Airport Staff only. In the intervening years, each terminal has an individual, dedicated bus service and frequency. As well as improving the quality and performance of the service, we have added innovations such as GPS-tracking on each individual bus. This has allowed the Operations Team to monitor fleet and driver performance, and more specifically micro manage the service during periods of high volumes of traffic or congestion. More recently real time passenger information technology has been introduced. This cloud-based GPS tracking system incorporates a sophisticated prediction engine providing up-to-the-minute bus service information. The system knows at any given time where a bus is and can predict the bus arrival time at any bus stop along a chosen route. The technology currently provides travellers with real-time passenger information via bus stop displays and a phone apps. 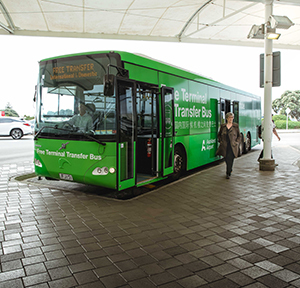 In 2015, Bustravel NZ was awarded the Free Terminal Transfer service. A dedicated Class 4 specific bus, this service has been operated using one vehicle, 20 hours per day circulating between the Terminals. To allow for growing capacity requirements, in Summer 2018 the service was increased to two buses. Buses depart from each terminal every 8 minutes. This service also provides real time passenger information, and is on the company’s GPS fleet management system. 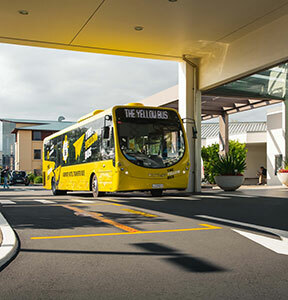 A 24-hour scheduled service operating in the Airport Precinct, the Yellow Bus calls on partner hotels and vehicle rental businesses. From humble beginnings back in 1985, the Yellow Bus became part of Bustravel NZ in 2008. Since that time the company has introduced customer ticket machines at the airport Terminals, as well as increasing the number of buses in circulation to accommodate growing patronage. 2018 was a big year for the Yellow Bus team! 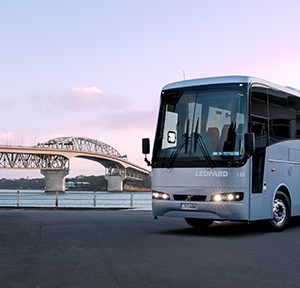 As Bus Travel NZ is part of the Leopard Group, Leopard Coachlines offers a wide range of options for corporate and group travellers wanting to explore New Zealand. Five Star luxury coaches and Four Star deluxe coaches are ideal for transporting tour groups in comfort around New Zealand. Corporate groups may have interest in our ELITE fleet whilst we have a range of buses ideal for long distance school charters, or moving your sports group around New Zealand.